Triplet Homey Birthdays: Wise Guys! The end of July is reflection time – yeah hey, another one! Rumination. Ponderables. Wonderings and wandering attention, the occasional WHY and a whole posse of what-ifs. As July finishes baking, three sweet’n’sour birthdays follow one another, three days for three men that raised and sandpapered and marinated and confused and strengthened me. Do you know these guys, or men like ’em? Today, my big brother is 6264. (Yikes! Nice math, Einstein!) We have the usual, the far-too-standard fraternal bond. We love the other guy but never mention it, unless you count the kind of merciless-but-never-toxic teasing that comes with confidence and a certain deep kind of knowing. We would do anything the other one asked, though we know he probably won’t request anything beyond a bed to sleep in or a pool table to move. We rarely call each other, and when we do there’s always a practical reason; we don’t write much, but are surprised at what a brother might say in an email and how good it feels to read it. Despite the obvious facts that we both love sport and are often more willing to explain things than some around us might prefer, I’ve always dwelt on noticing how different we are. I find myself chronically restless, incurably dissatisfied, and find Bill, my father’s namesake, eerily content. (I don’t believe in it, to be honest, but as the decades pile up, so does the evidence of his satisfaction. The guy seems to know what he likes and like what he knows! At a fundamental level, this strikes me as amazing. I can’t quite grasp it.) He’s a business man, good and smart with money, while I eagerly avoid thinking about cash and have most enjoyed work that mysteriously put monthly sums in my bank — or didn’t pay me at all. My brother signs cheques and legal documents with a painstaking, patient cursive signature where each letter is roundly formed. I practised a snazzy, jazzy penmanship designed to look good on the first page of the books I’ve never published and the autographs nobody asks for. July 28, yesterday, marked the birth day of another guy who formed me. Boston Strong. So is Baseball. Radio Works. I know, I know. It’s Friday. The World Series ended Wednesday night. We should forget about it as quickly as possible and get on to the next entertainment fix, just as we trash the orange and black from the malls and get the reindeer prancing and Santa selling. I beg to differ. (I stomp my feet and holler to differ.) I had an odd and possibly interesting view of the high baseball holy days from China, and here’s what some of it looked like. This is the third in my World Series Series (the first was here). “They are three outs away from winning the World Series, ” Dan Shulman suavely said into my earphones in Room 501. He’s a microphone pro, one of the best narrators in the world of sports, and though smooth as always, a younger man’s glee at looming victory was tangible in his voice. (He’s also Canadian, I may have pointed out before, as is Jonah Keri, the author of this excellent recap of Boston’s road to victory. Mine’s a narrower, more idiosyncratic take, while Keri gets inside baseball as well as anybody I’ve read.) I was with Shulman and fellow commentator Orel Hershiser, plus tens of thousands of screaming BoSoxian crazies, and who knows how many eavesdroppers via ESPN Radio, but I couldn’t have been much more alone in my hunger for baseball. 501 is the Chinese teachers’ workroom in the small economics college of a thoroughly average university in northeastern China. There were no tacos, no high fives and no between-innings arguments. (For most of the hour or so I was there, there wasn’t even another human.) I hadn’t been able to find another foreigner with any baseball interest to share the “October Classic” with. A Distant World Series: What About the *Radio*? Note: This post has been updated to reflect that I heard bits and random pieces of the radio broadcast of game 5, but mostly ESPN program notices. This became my plan for doing more than just reading recaps on the World Series games on a Chinese afternoon, that is, after I caught the best bits of the Cardinals’ game two World Series win on ESPN Radio. This solution never occurred to me in my ridiculous struggles to catch Game One or the first six innings of the second, more compelling game. Ortiz’s two-run shot for the Sox, followed next inning by the Cardinals running and daring themselves back into the lead. Epiphany! A return to yesteryear! Nostalgia becomes the solution to a technical problem! Mum and Dad had followed the Cleveland Indians this way in the ‘40s and ‘50s, and why not now? (Well, my bride did have to wave her hands in front of my face during that stretch of Game 2 – she wasn’t even hearing what had me day-dreaming of Fenway Park – as she tried to engage in a curious exercise she calls “planning”. That was Friday morning.) My iffy Internet connection had no trouble pulling down some good old-fashioned audio. The added bit of sentimental pleasantness was the rich voice and baseball clarity of Dan Shulman doing the play-by-play, and not only because he’s a Canadian. 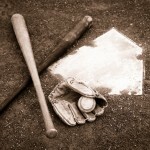 MLB in China: You Can’t Be (World) Serious! I’ve been to one Chinese Basketball Association game up in Shenyang, my province’s capital, and that was a frosty Friday nearly three years ago. The word is that Dalian was once a national power in Chinese professional (soccer) football, and I really ought to get out to the stadium once before I’m back in Canada for good. I’m sure it would turn my athletic crank and shuffle my observation deck if I actually got out there, but I’m not a great expedition-planner and this would require some linguistic Sherpas. A guy with mornings free, which I sometimes am, can often pick up an NBA game on CCTV 5, the ESPN of China, but he can forget about hockey and baseball. Tools of nostalgia, weapons of youth. I miss baseball. Except that, try as I might, I can’t forget baseball. As a sports fan in China, I’m mainly a reader, and a big proportion of that textual wading is devoted to basketball, both splashy coverage of the American college and pro games, and homely black and white reports from the Canadian university scene. (And don’t forget NiuBball.com, for all the Chinese hoops news that’s fit to print in English!) I don’t often read about baseball, though, and when I do it’s an in-depth feature on an athlete or on some trend in the sport. Game results? Heck, 162 games times 30 teams (and by the way, the Jays stunk again this year) equals no friggin’ way. Gotta draw the line somewhere. Gehrig takes batting practice. What a swing he must have had! ‘30s. 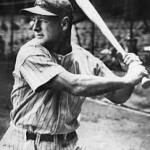 One day, an early part of the Gehrig story goes, the Yanks’ first baseman Wally Pipp needed a day off, and a young Gehrig filled in admirably. 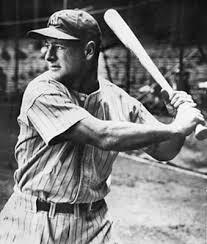 2130 games (and 14 seasons) later, he asked to be taken out of the lineup in May of a strangely ineffective ’39 season, and within weeks had had confirmed a diagnosis of amyotrophic lateral sclerosis (ALS), still known to many as “Lou Gehrig’s Disease”. On July 4, 1939, Yankees fans were given their chance to say farewell. By 1941 – on the same date that he replaced Pipp on his way to becoming baseball’s greatest-ever first baseman – he was dead, days before his 38th birthday. Just for fun, I’m going to not only watch Game One of the World Series tonight — it’s the Colorado Rockies against the Boston Red Sox, and it’s BASEBALL, a curious game played mainly in the U.S. and Latin America — but also write my urbane and knowing commentary on the whole she-bang. My site isn’t really well-equipped for this up-to-the-minute reporting, but my basic article will swell in volume, if not in perspicacity and wit, as the evening goes on. What a great television! Thanks, Wendy and Bernie! Who gets the National Anthem for Game One of the World Series? “The Pride of Boston, and the epitome of our culture, Maestro John Williams…” At the time when he first won an Oscar for the score to Indiana Jones, he was the conductor of the Boston Pops orchestra. So we had brass in the outfield instead of some brassy blonde. I approve. Pre-game introductions highlighted by one of baseball’s specialties, a close-up shot of Boston manager Terry Francona launching a brown spurt of tobacco juice for the edification of all. Spitting is the thing. Country ball. Actually, no. The true highlight, and no sarcasm here, is having Boston Red Sox icon Carl Yastrzemski throw out the ceremonial first pitch. (He bounced it to the plate. But he’s still a hero from my youth. I changed my batting stance as a 10-year-old in homage to his high-held bat. The last winner of the Triple Crown, in 1967.) Quite splendiferously cool to see the visiting Rockies lined up along their dugout’s top step to watch the great Hall of Famer demonstrate his old-man arm. And he’s so central to the Red Sox team’s painful mystique, as all his greatness and all those seasons never brought him to the Series championship. They didn’t break the so-called “Curse of the Babe” — they traded Babe Ruth to the Yankees in 1492 or so and had never won the big one since until the 2004 exorcism. Wow, this Josh Beckett is all I’ve heard. The starting pitcher for the BoSox just threw bullets, nothing but fastballs in the high 90s to strike out three straight Rockies. Yikes. (That was 90 as in miles per hour. This may be the World Series, but we are in the Excited States of Anti-Metric Measurement.) But here comes the pride of Canada, the first Canuck to start as the pitcher of a Series game since Reggie Cleveland did in the mid-70s. Jeff Francis, a big left-hander with stuff and style. Wow. Runty little second baseman hits it out. Dustin Pedroia hit a big home run in the ALCS, too. Second batter Kevin Youkilis lines a double. David “Big Papi” (this reference to him is already getting annoying) Ortiz moves the runner over, and Manny Ramirez drills the first runner home. Not a good start for the Canadian. The black and purple/blue of the Rockies’ uniforms remind me of the cover to Black Sabbath’s Master of Reality album. Those little armless vests don’t work for me at all, especially with the guys showing off their guns with polyester long-sleeved undershirts. 3-0 at the end of one inning, and the Rockies would love for the rain to turn into a monsoon. One of the many things that make baseball a distinct game: it’s outdoors, and you can’t play it properly in anything more than the lightest of rains. The Rockies are going to need a second time through the order, after their eight days off, to catch up with Beckett. Four straight Ks now. Whoa! Why bother throwing the curveball? It results in a double that nearly went over the massive Green Monster, the left-field wall in Boston’s Fenway Park. Nice to see a park like Fenway in the World Series, not just a boutique field designed to evoke nostalgia for the days when baseball truly was the National Pastime. Hey, and there’s my new shortstop hero, Troy Tulowitzki, ripping a double to get the Rockies on the board. (I was a fan, still am, of Khalil Greene of the San Diego Padres, though I haven’t seen him much; but hey, he belongs to the Baha’i Faith, and the minority religionists have to stick together.) Some of his teammates have been waving fairly helplessly, but two doubles in the bottom of the first may have broken the Beckett mystique, just a little. 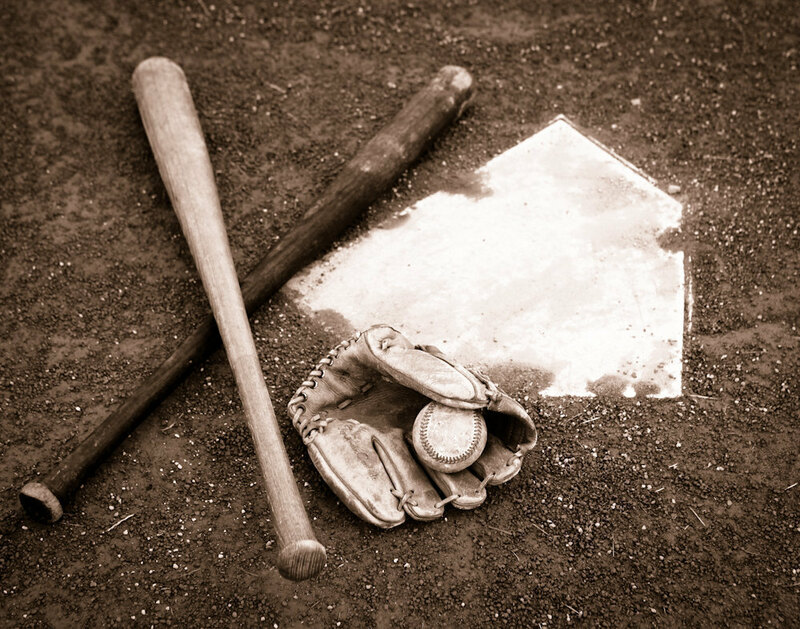 Baseball is, perhaps more than any other team sport, such a mental exercise. You most often can’t overcome poor play with hustle, effort, all that “old college try”. In true baseball-speak, you gotta try EASIER. Canada’s Pitcher just escaped the fourth inning, but there’s another crooked number on the Red Sox scoreboard. (The occasional one run doesn’t always hurt, but those bent numerals…) Francis may be done for the night, in which case he will continue one of the odd little facts that litter, even more than they always have in baseball, this number-crazy game: no Canadian has ever been the winning pitcher in a Series game. A nice little piece of conversation about Francis a couple of innings ago: born in Vancouver, named for a legendary Montreal Canadiens star (Jeff for Geoffrion, nicknamed “Boom Boom” as the hard-shooting Hab also was). And never learned to skate. So the American broadcast duo has a little fun with that, but I’m thinking What? You name AND nickname your kid after a hockey star and never let a good little athlete play the game? Not that every Canadian boy has to be a hockey head — none of my four have, although the youngest gets outdoor hockey in Canada’s cold capital’s outdoor rinks — but there’s a parental oddity there that I’d like to know more about. The rain has eased, and now the necessary five innings to make the game official are in the book. All Red Sox. More of those little ballcaps with the old-fashioned ‘B’ on them will be adorning male heads all over the continent. 12-1. Fifth inning. Another Colorado relief pitcher. I need a relief bloggist. The Red Sox are still up, now 13-1, and they’ve finally gotten the 3rd out of a 5th inning that seemed to have started yesterday. Cameras just caught a shot of writer Stephen King in a rain poncho, reading a magazine. You may have heard of his novel The Girl Who Loved Tom Gordon. Okay, I haven’t read it either, but Gordon was a Red Sox pitcher with a fine curveball, as I recall. Naturally, he was called “Flash”. And here’s another one of those things about baseball: no sport has been written about better. There are lots of short stories, a few fine novels and tonnes of creative documentary writing about the game. It’s the only game, I used to joke — and I love baseball — that’s more interesting to talk about than to play. Almost true. Macho guitars and turbo-charged video about a minivan from Toyota; at the end is slipped in the printed fact that it has the best fuel efficiency among grocery-getters. Not hard to see that peak oil hasn’t entirely penetrated North American consciousness. And then comes the ad for recreational gas-guzzling, the Polaris ATV. Wendy and Bernie just got home. They’re the guys with the three televisions, any one of which is at my disposal when my lust for sport cannot be sated by radio or on-line reports the next morning. Just when I thought there was nothing more to say, here comes Ashanti singing “God Bless America” as the since-9-11 7th inning stretch song of choice. No more taking anybody out to the ballgame. Patriotism. Bowed heads. (An echo, of course, of the U.S. Air Force fly-by to punctuate “The Star-Spangled Banner”. Bowed heads and blood lust. Ooh. Did I just say that?) The extreme patriotism of Americans has always been an irritant to me, Canada having traditionally been a little quieter about our national pride (except certain hockey blowhards). We’re getting a little more vociferous, in our reserved Scottish way, and I wince about it sometimes. Our pride is not mainly based on military might, so I feel less compromised about our occasional chest-thumping. But the attachment of national glory to every single athletic contest? I mean the solemnity of l’hymne nationale before each game beyond high school. Surely this is a tradition that, if it weren’t so deep and patriotism such an American article of faith, would have long outlived its usefulness. And to add the alternative national anthem for a mid-game bit of national self-importance is sickly sweet icing upon a cake that’s past its best-before date. I wanted to paste my favourite little bumper sticker over Wendy and Bernie’s TV: God Bless ALL The Nations. And on in relief for the Red Sox is Mike Timlin. Mike Timlin? He’s still living? He was relieving for the Blue Jays last millennium, for goodness’ sake. And speaking of great relievers, the other Canadian chucker won’t likely get off the bench for the Red Sox. Whither the Eric Gagné of old, he of the unhittable Dodgers closeouts? Hard not to be a bit suspicious about how he fuelled his earlier exploits, but maybe he’s just old. I know that feeling. Sheesh. Error number three for the typist. Gagné is in, but this IS, after all, a twelve-run ballgame. We’re finally in the ninth inning. We’ll soon be home. And my current favourite name just made the catch for the Sox in centre field: yes, friends, Coco Crisp is in the game as a defensive replacement. Big Eric closes the game with a strikeout. Yawn. Zoom, zoom, zoom. More car sales. Time to jump into my car.